February is always an exciting time in the garden. The days are getting longer and spring is on its way. Growing vegetables in containers is a very good way of making the most of restricted space because when the crop is over the container can be either moved, dismantled or used for other planting. If you have ground which is full of tree roots or you know you have a pest which overwinters in the ground and causes trouble or you have clubroot or similar gardening woes, container gardening is the answer. Additionally, if you have problems bending or kneeling, growing vegetable in containers is the answer as they are by definition raised from the ground. There are various rules which you have to follow when you start to grow your vegetables in containers, whether they are in grow bags, large pots or raised beds of some kind. The first problem which raises its head is the watering. You must make sure that your containers are well drained so that the roots of the plant don’t drown in water held in the soil. This is not a problem in open ground of course, as the excess water drains away except in the most extreme conditions. The water the vegetables get has to be regular, not too little and not too much. If you give the water irregularly, then the growth of the vegetable will be uneven and you could get splitting or withering. Tomatoes have a lot of problems in this regard and you could end up with a crop which is not of a very high quality at all, as well as falling foul of blossom end rot and all manner of other nasties. really do so well on artificially enhanced soils and some other vegetables such as cabbages are much more fussy than their down to earth reputation suggests. You can overfeed things like carrots and end up with tasteless monster sized roots. With the popularity in container gardening these days it is easy to buy composts specifically for vegetables and unless you are a very experienced gardener it is best to stick with one of those, reading the label very carefully to make sure it is the right one. Once you have made sure that you have the right strain of seed, the right container, the right soil, the right feed and that you know what the watering regime should be, you are good to go. With reasonable luck you should get a good crop of vegetables from your containers and although you won’t have huge amounts of anything, you will certainly benefit from having vegetables as fresh as they come and which taste better than from any shop. But don’t be tempted, when the crop is harvested, to simply put your containers aside to wait for next spring. The soil will be depleted of nutrients and may have collected some pests along the way, so it is best to renew it for the next season. You can mix the old soil with your compost heap where the heat of the process should kill any pests and of course if you don’t plant the same vegetables in it, pests shouldn’t really matter. In a few years it will be ready to use as compost in a container. With these problems overcome, there are many benefits to growing vegetables in containers, not just the obvious ones of making veg available to those with a small plot. Containers can bring fresh food into your life even if you only have a concrete yard and this has to be a good thing. Children love it as they can experience food as it is meant to taste as well as discovering what peas look like before they are bagged up and frozen. With no stones or roots to contend with, your carrots will be straight and lovely, your leeks with be tender and white and rotating for length of season is a breeze. A fun thing to consider when growing vegetables in containers is; what weird and wonderful things do you already have which would make a good container? If you look around your house and garden you probably have lots already and if you are prepared to knock a few holes in the bottom it looks really wacky if you use old saucepans (as big as you can manage) to grow salads in. A couple of Salad Bowl lettuce in an old jam saucepan can be placed by the kitchen door and will always be handy to perk up a sandwich. If you are eco-conscious you probably have some ‘bags for life’ stashed under the sink. 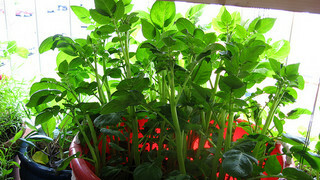 Get them out, punch some holes, fill with compost and add the vegetable of your choice. With careful staking for support they can give you enough room for some peas, beans or even raspberries if you are careful with the variety. Bin liners make great potato grow bags and an old wicker laundry basket is a super home for a couple of seasons for strawberries. Once you get your eye in for what you need, the world will be your oyster and you will soon be growing vegetables in containers all year round.